Clippesby is believed to have Viking origins (indicated by the “by” ending to its name). At that time the settlement was bordered by a saltwater lagoon that existed before the ‘sandspit’, where Great Yarmouth now stands, formed, to block the entrance to the North Sea. Subsequent drainage by windpumps created rich agricultural land upon which the settlement was largely dependent until recent years. There is an entry for Clippesby in the 1086 Domesday Book where it is recorded as Clepesbei. Clippesby Hall has had two incarnations over its history. The first Hall appears to date from 1585 (although it is recorded in the reign of Henry II – as far back as 1154–1189). It was most notably occupied by Sir Clipesby Crewe, Chief Justice of England and first Recorder of Great Yarmouth. The Old Hall subsequently became a farm and is today known as “Old Hall Farm”. The current Hall, on this site today, was formerly known as Clippesby House. 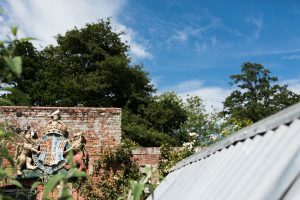 This second Hall and estate was first owned by the Muskett family, and it is that family’s coat of arms and crest which adorns the current entrance and is part of our logo today. The Muskett family lineage is recorded in ‘A Genealogical and Heraldic History of The Commoners of Great Britain & Ireland’, by John Burke Esq. published in 1835. This family originally resided and possessed lands in the parish of Haughleigh [Haughley], in Suffolk, in the reigns of Henry VIII. Edward VI. and Elizabeth I. and a branch continued there until the year 1774. WILLIAM MUSKETT, esq. who was living at Haughleigh [Haughley] in 1565, purchased in 1598, an estate in Rockland St. Peter’s, called “Ladies Manor” having been the property of Lady Bigod. He died in 1619, and was survived by his son, ROBERT MUSKETT, esq. a wam adherent of royalty during the troubles which clouded the time of Charles I. He was survived in 1630 by his son, SIMON MUSKETT, esq. who removed from Haughleigh [Haughley], and took up his abode at Bisingham [Bressingham], in Norfolk. The daughter of this gentleman married Henry Bloomfield, esq. of Fersfield, grandfather of the Rev. Francis Bloomfield, of Fersfield and Billingford, who wrote the History of Norfolk. His son, JOHN MUSKETT, possessed landed property in Brisingham [Bressingham] and Fersfield. 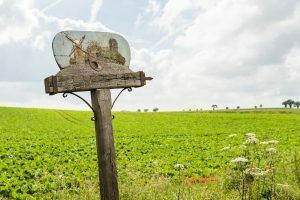 In the latter he held a lease of forty-two acres of pasture from the Duke of Norfolk, at the yearly rent of three shillings and six-pence, which land is now in the occupation of one of his descendants. His son, ANDREW MUSKETT, settled at Thelton [Thelveton] in Norfolk, anno 1659, and adopting the sentiments of the Quakers, suffered much in those persecuting times. He left four sons and one daughter, viz. John, Andrew, James, Charles, and Elizabeth. 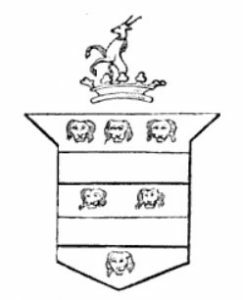 The eldest son, JOHN MUSKETT, resided at Newton-Flootman [Newton Flotman] in Norfolk in 1748, and acquired a considerable estate in Roydon and Tebinham [Tibenham], but leaving large family, the property was sold at his decease. He married first, Miss Hart, daughter of Mr. Charles Hart, of Hapton Hall, and had one son, John, and two daughters. He espoused, secondly, Anne, daughter of Mr. Ephraim Heywood, of Diss in Norfolk, and had further issue, viz. • Mary, married to William Richardson, esq. of Langbarf, in the county of York. • Sarah, married to J. Whiting, esq. of Epsom. • Rhoda, married to — Hart, of East Grinstead, Essex. The eldest son of the second marriage, JOSEPH MUSKETT, of Easton in Norfolk, raised a large fortune by his indefatigable industry as an agricultural and land agent, and purchased considerable estates. In 1808, he bought from the trustees of Henry Hobart, esq. the parish of Intwood; the manor and estate of Lord Rosbery in Plumstead Parva [Little Plumstead]; and the manor and parish of Clipsby [Clippesby]. He wedded Elizabeth, daughter of Thomas Salsbury, esq. of Chevely, in the county of Cambridge, and left two sons, JOSEPH-SALSBURY MUSKETT, now of Intwood, & HENRY MUSKETT, of Clipsby [Clippesby], who married Emily, daughter of Thomas Grant, and has issue, Henry, Emily, Julia, and Clara. Henry Muskett, of Henry & Emily referred to above, was the local parish Rector of St Peter’s Church, Clippesby, between 1860 and 1897 and is pictured on the Church’s excellent website. The church of Clippesby St Peter is one of 124 existing round-tower churches in Norfolk. St. Peter’s is adjacent to Clippesby Hall. In an artistic link the church was the subject of a painting by John Sell Cotman. Another distinction is a fine Arts and Crafts style stained glass window “Suffer little children”, the first professional commission by M. E. Aldrich Rope. The building is thought to date from Saxon times. Curiously, however, there is no mention of it in the Domesday Book although the round tower is certainly of Saxon construction as is a small (now sealed) window, whereas the North doorway with its characteristic zig-zag moulding is Norman. The tower was augmented with an octagonal bell tower in the early 1900s. A tiny mass dial (2″ across) is located in the porch and dates from c.1400. 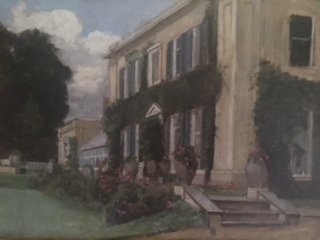 In 1909 the hall was purchased from the Muskett’s by the artist Peregrine Feeney and his wife Emily. She was the sister-in-law of the noted pre-raphaelite painter John William Waterhouse who became a regular visitor and painted the hall on at least one occasion. Originally the Hall had two storeys but following its use by the army in World War II the upper floor fell into disrepair and was demolished after severe storms shortly thereafter. The hall was then purchased by the McCarthy family, owners of East Anglia’s leading supplier of quality seasonal fresh fruit and vegetables from local farms and around the world. Founded by Thomas McCarthy, the company began as a fruit and vegetable stall on London’s Drury Lane in 1877. The family took their summer holidays in Great Yarmouth and in 1903 Thomas’ son Daniel opened a stall in its bustling market place before joining the Navy during the First World War, leaving his son Dan to run the stall with his mother. The pair continued to grow the business and formed McCarthy’s as a limited company on 5th May 1939. McCarthy’s began supplying the Royal Household in the late 60s, granted the Royal Warrant for HM The Queen in 1970, and overseeing the quality of every item delivered when the Royal Family visited Norfolk, including HM The Queen’s annual residencies at Sandringham House. McCarthys continues to supply the Royal Households to this day, at one point in time holding three separate warrants to HM The Queen, HM Queen Elizabeth The Queen Mother and HRH The Prince of Wales (the latter two both granted in 1990). Since the war the estate has been used as a market garden and a garden centre, prior to becoming the holiday park it is today. Around the park you will see a number of large flower pots purchased from that time which bear the crest of Great Yarmouth Borough Council, with three lions adjoined to three herrings. The Hall itself is still the family home of a descendant of the McCarthy family, John Lindsay, a keen gardener, and his wife Sue, a keen baker (of Susie’s Coffee Shop fame).